Sickle cell disease is an inherited blood disorder which patients have abnormal hemoglobin S levels in their red blood cells. Hemoglobin S is a vital protein that carries oxygen throughout the body, which is critical for cells in all tissues to function properly. 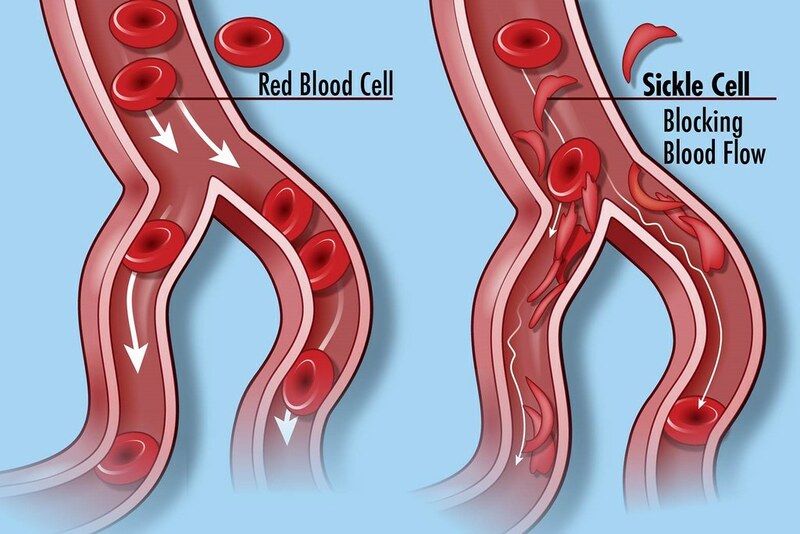 Healthy patients typically have red blood cells with hemoglobin in the shape of a flexible circular disc, whereas patients with Sickle cell disease have red blood cells in the shape of stiff rods that may transition into a crescent-like shape. In return, these stiffer abnormal cells experience a rather difficult time passing through blood vessels and can even stick to the vessel walls. This increases risks for blood clots or blockage to form and even minimizes oxygen intake and flow throughout the body. This genetic disease is known not to be contagious, as it is passed onto children who inherit two abnormal hemoglobin genes from their parents. Even though patients with sickle cell disease are typically diagnosed through a blood test, prospective parents who are aware that their genetics carry this trait must seriously consider the risks of passing this to their child. To date, there are currently no treatments to cure sickle cell disease. The standard of care for sickle cell patients usually includes continual intake of penicillin to prevent infections, additional doctor visits in order to screen and prevent episodes in advance, additional immunizations and vaccinations for infection prevention, and maintaining a healthy lifestyle. However, in a 2018 study found in the journal, Biology of Blood and Marrow Transplantation, doctors from the University of Illinois Hospital recently reported a new clinical transplant protocol, which fully cured seven adults of an aggressive form of sickle cell disease. Stem cells from matching donors, usually close family members, were transplanted into patients via a non-traditional transplant approach. The optimistically positive outcome was rather surprising since stem-cell transplant protocols were known to have a low percentage of success, particularly due to challenges of finding a “fully-matched” donor that had a full set of matching human leukocyte antigen (HLA) markers. A closer match will improve chances for a successful transplant to cure sickle cell patients since matching HLA markers between the patient and donor reduces risks for the patient’s body to reject these new cells. Yet, only 20% of sickle cell patients have a family member with compatible stem cells with full HLA matching markers. In this newly reported protocol, sickle cell patients, particularly those with the aggressive form of the disease, can actually just receive stem cells from donors that surprisingly only have half of their HLA match instead. This new transplant approach is highly innovative and actually enables more sickle cell patients to receive proper treatment by overcoming the challenges of identifying closely matched donors within family members. The doctors and researchers have been long pioneering the use of chemotherapy-free, fully matched stem cell transplants for sickle cell patients for over 6 years of grueling hard work. If these clinical studies continue to show promising outcomes, this will be a groundbreaking discovery to treat sickle-cell disease for many more patients.